Part 9 - Rocker Rust -- Let The Assembly Begin! New Year's Day ended up being the perfect day to get started on putting the car back together. 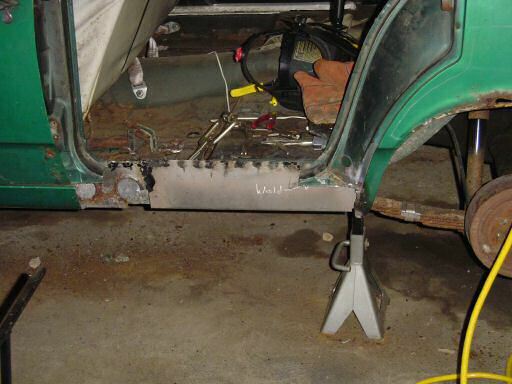 I began by spraying weld-through primer on all the edges of the outer rocker panel and the applying a rust treatment to the back of the new panel where I wouldn't be welding. Once that was done, it was simply a matter of lining up the new panel and tacking it in place. After it was tacked into place, I re-fit the rocker cover to make sure it still fit and then finished welding the panel in place. The picture below shows what it looks like after all of the welds were ground smooth. You'll notice that there's a small section missing from the original panel. That section was badly rusted but it was in good enough shape to use to help line up the new panel. I cut a new piece to weld in but I ran out of time so I'll need to tackle that later. I also wrote myself a reminder in chalk that I have another area to weld up before the rocker cover goes on.